Sometimes there’s nothing more tempting than to dig into a big old ice cream sundae, especially on a hot summer day! Well, we know that most of us wouldn’t do that on a normal basis, so I have come up with the next best thing! My Banana Split Yogurt Parfait is still packed with all the flavor and sweetness of ice cream but without the unnecessary calories, sugar and fat. What’s more, you could incorporate this on a regular basis without any guilt at all! Why? It’s packed with healthy protein, fresh fruit and only 1 gram of fat! So, grab that spoon and dig in! Enjoy! 1. Put 3/4 cup Greek yogurt into one small mixing bowl and 1/4 cup Greek yogurt into a second mixing bowl. 3. 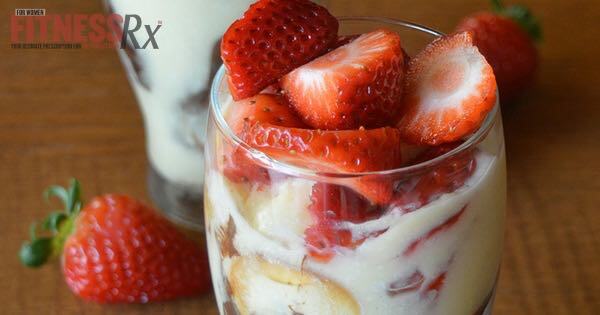 Arrange 2 parfait glasses (standard glasses or bowls will work just fine) by layering banana and strawberry slices with vanilla yogurt mixture and chocolate yogurt mixture. NOTE: you will be using half the amount of chocolate as vanilla, so apportion accordingly. 4. Put in the fridge for about 20-30 minutes to set. Or for an even more ice cream-like treat, put in the freezer for about 15-20 minutes. Enjoy!